Launched in 2014, Professional Learning Leader certification focuses on those who provide professional development to educators across all curricular areas. The curriculum includes ISTE Standards for Coaches. Participants will integrate contemporary technology into leadership and professional learning practices using web-based software and resources that serve adult learning objectives and educational goals. This class includes both theoretical and experiential components; participants will explore and research examples of effective practices in 21st Century learning environments, but will also spend a substantial portion of course time developing educationally meaningful and personally relevant products to support your role as a leader. 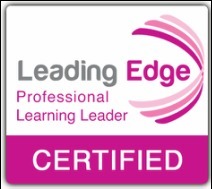 See Leading Edge Certification's Professional Learning Leader for more information on this certification. See Leading Edge Certification's Administrator for more information on this certification. ​As a Leading Edge Certified Leading Educator, I have the ability to lead training on any of the Leading Edge certifications listed on this page. There is no portfolio associated with this certification. Launched in 2011, Online & Blended Teacher Certification guides educators through a curriculum based on the iNACOL National Standards for Online Teaching. Upon successful completion, the certification will give schools, districts and other prospective employers assurance that Leading Edge Certified Online & Blended Teachers not only have the skills to effectively facilitate online and blended courses, but also have a solid understanding of how to enhance the learning opportunities for all students enrolled in their courses. See Leading Edge Certification's Online & Blended Teacher for more information on this certification.